Joel Farabee and Logan Cockerill have been named to the United States’ preliminary roster for the 2019 World Junior Championship. Both are forwards for the Boston University Terriers of the NCAA where they play on the same line. Farabee and Cockerill are able to produce scoring chances night in and night out. They have the skill required to finish on these opportunities and have done so a number of times this season. The two linemates are also able to contribute on special teams, both on the power play and the penalty kill. Perhaps the most unique asset they could bring to Team USA is chemistry. Farabee and Cockerill have played alongside each other for the majority of the season, and have complemented each other’s playing styles very nicely. The 14th overall selection at the 2018 NHL Entry Draft has earned top-six honors with BU during his freshman year. The 6-foot-1, 170-pound winger has a sizeable frame for an 18-year-old college player. Despite that, the Philadelphia Flyers prospect looks as though he has motors in his skates, speeding down the wing to create opportunities. In fact, the majority of Farabee’s points seem to come when rushing down the right and left wings. After getting by a defenseman, the New York native will either work his way into the slot for a shot or send a cross-crease pass to crashing forward. Both maneuvers have bred success, leading to a stat-line of four goals and seven assists in 16 games. Speaking of his offensive production, it’s hard to talk about the 18-year-old without mentioning his powerful wrist shot. Farabee has the ability to give goaltenders nightmares. He blends power and accuracy for a potent concoction that leaves opposing netminders in a haze. He doesn’t always need to get to a high-quality position on the ice — Farabee has proven that he can get the puck to the back of the net from above the circles and from the wings. Yet, one of the most compelling aspects of Farabee’s game is his play in the neutral zone. He has consistently caused havoc on either side of the red line resulting in turnovers. As many of those who watch the sport know, a turnover at your own blue line is one of the most dangerous turnovers in hockey: all five skaters are heading up the ice and your defensemen can be easily beaten when trying to recover and get back into position. Farabee seems to know this and capitalizes on it nightly. 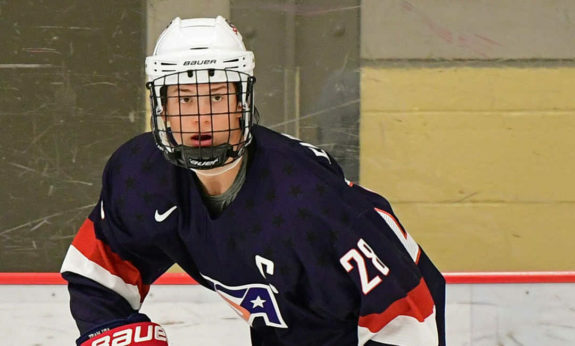 In 126 games with the US National Development Program (both U-17 and U-18), Farabee came up with 58 goals and 67 assists, 14 of those goals coming on the power play. Seeing as though Farabee has been in the program before, and coupling that with his success in the NCAA thus far, Farabee will likely make the official roster. Cockerill has also had a solid season, now being in his sophomore year at BU. While he is falling behind last season’s totals (eight goals and 12 assists in 37 games), he has still contributed to the Terrier’s efforts in a high capacity. Cockerill currently has just two goals and three assists in 16 games, but that could certainly change if he continues to play the way he has been all season. Related: Should the Blues Loan Thomas to Team Canada? Cockerill also has a solid two-way game – so solid, in fact, that he sees time on BU’s penalty kill. It’s a huge bonus to his offensive skill and could put him over the edge in his goal of making the finalized roster. He has combined his offense and defensive tendencies to come up with two shorthanded points this season — a goal and an assist in back-to-back games. In 99 games with the U.S. National Development Team, Cockerill came up with 20 goals and 28 assists. It is clear that he has never wowed onlookers with statistics — that’s because being a lethal goal-scorer has never been his biggest asset. He kills penalties and plays a solid defensive game, all while creating offensive opportunities. Both Cockerill and Farabee bring a 200-foot game and offensive skill. However, their best attribute is their chemistry. Having played on the same line this season, both of these forwards give Team USA two-thirds of an offensive unit. All they need is a center to help them out. This season, senior Bobo Carpenter has centered them – a solid two-way forward himself who currently leads BU in goals with 9 tallies. USA has two solid additions in Farabee and Cockerill. Both have played with the program before, meaning they already have their foot in the door. 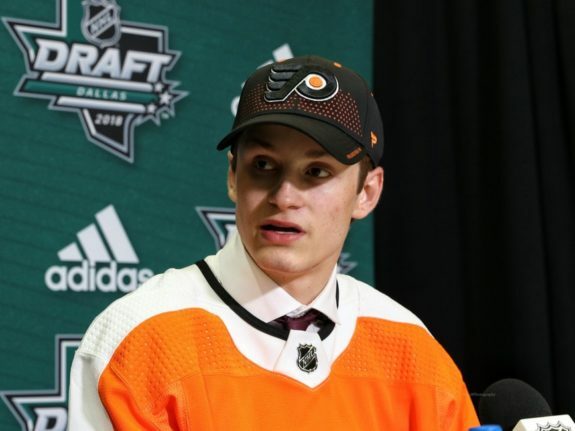 It is highly likely that Farabee and Cockerill will be named to the final roster – as they should be.